On 25 September 2017, a 16-year-old youth from Al’ Arrub is arrested by Israeli soldiers at 2:30 a.m. 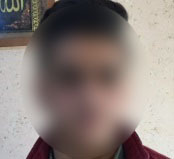 He reports being interrogated in Etzion settlement without being informed of his legal rights. He was released without charge on 28 September 2017. I woke up terrified to the sound of loud banging on the front door. It was 2:30 a.m. My father opened the door and about 20 Israeli soldiers entered our home. Three of the soldiers were wearing face masks. The soldiers asked for our identity cards and when they saw my name in my father’s identity card the commander asked me to prepare myself for arrest. I put my clothes on and then I was taken outside. We were not given any documents about my arrest. On the way out the commander told me I was accused of throwing stones at soldiers. The soldiers walked me to the military watchtower on the main road where a soldier told me they wanted to take me to Etzion settlement for questioning. He tied my hands to the front with three plastic ties: one on each wrist and one connecting the two. The ties were not painful. He also blindfolded me and then told me to start walking. I told him I could not see so he led me by the hand. I could feel a dog sniffing me and I was terrified. The soldier led me inside the watchtower and asked me whether I was hungry or thirsty. About 10 minutes later I was taken to the back of a jeep where I sat on a seat and the jeep drove to the nearby settlement of Karmi Zur. On arrival at Karmi Zur I was taken to a room where I sat on a chair until around 7:00 a.m. During this time I was allowed to use the toilet and I managed to sleep for about 10 minutes or so. At around 7:00 a.m. I was taken back to the jeep where I sat on a seat and the jeep drove me to the police station in Etzion settlement where I was taken for interrogation. As soon as I entered the interrogation room the interrogator told me I could remove the blindfold. I removed it and looked around me and saw the interrogator behind a computer and a picture of Al-Aqsa on the wall. The interrogator was staring at me intently without saying a word. I looked back at him and did not say a word. He did not inform me of my rights. The interrogator then started to talk about my father and brothers. He named one of my brothers and told me he was a doctor and told me my father was in administrative detention years ago. Then he told me my fate was going to be similar to my father’s because I was accused of throwing a Molotov cocktail. I told him I had no idea what he was talking about. I was then pushed from behind by a soldier who was in the room and I fell on a metal cabinet. Then I was blindfolded again and taken to another room where I was questioned by another person. The second interrogator did not inform me of my rights either and made me stand in the corner. He started by asking me what good my country was going to do me. I asked him to remove the blindfold but he swore at me saying I was a “son of a whore”. Then he told me that on 14 September 2017 I threw stones at soldiers during clashes. I denied the accusation. Then the interrogator removed the blindfold and I saw that his face was just 10 cm from my face. He told me I should be scared of prison and asked me for names of people who throw stones. I told him I did not know anyone. Then he told me someone had confessed against me but he did not say who. I asked him to bring that person so I could confront him but he never did. The interrogator then he asked me if I wanted a cigarette or a cup of coffee. I told him my father told me not to accept anything from him. He then took me outside and I was left in the sun for about an hour. I was re-blindfolded. After about an hour I was taken back inside, the blindfold was removed and the interrogator asked me to sign a document written in Hebrew. When I refused to sign he became angry and lost his temper and started to swear at me saying things about god. I told him my father told me not to sign anything. He tried to force me to sign and when I refused he slapped me. I asked him to call my father and he did. The interrogator put my father on speaker phone. I told my father where I was and told him the interrogator wanted me to sign documents. He told me not to sign. The interrogator started to swear again and my father heard him and then he hung up. Then he slapped me and told me I had a stubborn father. At this point there were three people in the room and they all took part in slapping me. One of them placed his pistol on the table. Then I told the interrogator I wanted to speak to a lawyer. He named a lawyer and called him and allowed me to speak to him on the phone. The lawyer asked me for my name and told me to stick to my position and said he couldn’t say any more in front of the interrogator. He also told me not to sign anything. The interrogator heard this and started to swear at the lawyer. Then I was re-blindfolded and taken to a room where I could hear a very annoying sound, like a broken speaker. I was left there on a chair for about 30 minutes. I was made to sit backwards on the chair so that I could not lean back. After about 30 minutes I was searched in my underwear and taken to a cell at Etzion. They brought me some food and I was with another child detainee. I could not sleep for a long time. I think I slept for 30 minutes or so. In the middle of the night soldiers came and shackled and handcuffed me and took me to Ofer prison. At Ofer I was searched in my underwear and taken to Section 13. I arrived there at around 2:30 a.m.
Three days later I was taken to Ofer military court. The military judge decided to release me because the prosecutor failed to present a charge sheet. I was released on 28 September 2017 without charge and I went home with my family. When I called my mother to tell her I was released she started to cry.